¡Bilbao quiere empezar a practicar Ashtanga Yoga! Nos lo habéis pedido y aquí tenéis una nueva oportunidad para iniciaros en la práctica tradicional de Ashtanga Yoga tal y como lo enseñó K. Pattabhi Jois y tal y como lo practican hoy miles de personas en todo el mundo. Así, el fin de semana del 12/13 de noviembre tendrá lugar nuestro sexto taller de iniciación en la práctica de Ashtanga Yoga. El taller tendrá lugar en Ashtanga Yoga Bilbao el sábado 12 de noviembre entre las 11:00 y las 13:30 y el domingo 13 de noviembre entre las 11:00 y las 13:30 horas. Además, las personas que asistan al taller podrán acudir a dos clases estilo Mysore en la escuela durante la semana inmediatamente siguiente (del 14 al 20 de noviembre) para poner en práctica lo aprendido dentro de un entorno tradicional estilo Mysore con otros practicantes. El precio del taller es de 60 euros, incluidas las cinco horas del fin de semana y las dos clases estilo Mysore de la semana siguiente (del 14 al 20 de noviembre). Además, la asistencia al taller exime del pago de matrícula en la escuela, lo que quiere decir que aquellas personas que tras asistir al taller deseen apuntarse a las clases regulares en Ashtanga Yoga Bilbao, no tendrán que abonar los 20 euros de matrícula. Bilbao wants to start practising Ashtanga Yoga! You have asked for it and here you are a new chance to get into traditional Ashtanga Yoga practice as taught by K. Pattabhi Jois and as thousands of people around the world practise it. So, in the weekend of the 12/13th of November will take place our sixth workshop for beginners to start learning Ashtanga Yoga practice. The workshop will take place at Ashtanga Yoga Bilbao on Saturday the 12th of November between 11:00 and 13:30 and on Sunday the 13th of November between 11:00 and 13:30. Besides, people coming to the workshop will be able to attend two Mysore style classes at our school during the week after the workshop (from the 14th to the 20th of November) in order to practice what they have learned inside a traditional Mysore style environment alongside other practicioners. The price of the workshop is 60 euros, including five hours during the weekend and two Mysore style classes during the following week (from the 12th to the 13th of November). Besides, attendants are exempt from registration at the school, which means that those people who after attending the workshop want to join our regular classes at Ashtanga Yoga Bilbao, won't have to pay 20 euros for registration. Bilbok Ashtanga Yoga praktikatzen hasi nahi du! Eskatu duzue eta hementxe daukazue aukera berri bat K. Pattabhi Joisek irakatsi zuen eta milaka munduan zehar praktikatzen duten araberako Ashtanga Yoga praktika hastek. Horrela, azaroaren 12/13ko asteburuan Ashtanga Yoga ikasteko hasiberrientzako bostgarren ikastaroa gertatuko da. Ikastaroa Ashtanga Yoga Bilbon gertatuko da larunbatean azaroak 12an 11:00etatik 13:30etara eta igandean azaroak 13an 11:00etatik 13:30etara. Gainera, etortzen diren pertsona guztiak hurrengo astean (azaroaren 14tik 20ra arte) Mysore estilo bi klasetara joan ahal izango dira beste praktikatzaileekin Mysore estilo klasean ikasia praktikan jartzeko. Ikastaroaren prezioa 60 euro da. Ikastaroak bost ordu asteburuan eta hurrengo asteko (azaroaren 14tik 20ra) Mysore estilo bi klase osatuko ditu. Gainera, ikastaro honetara etortzen bazara eta gero Ashtanga Yoga Bilboko klase erregularretara etorri nahi baduzu, ez duzu matrikularik (20 euro) ordainduko behar. 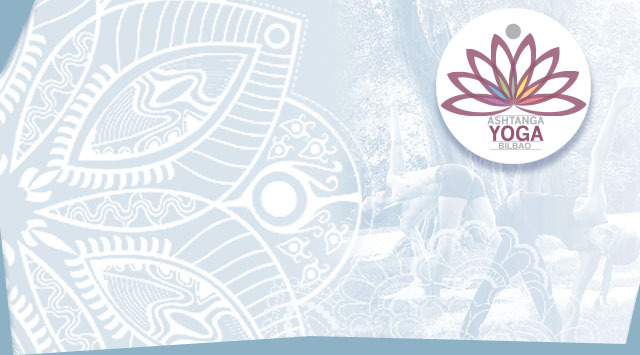 18/19 may: Un fin de semana para dar tus primeros pasos en Ashtanga Yoga. 18/19 May: One weekend to take your first steps in Ashtanga Yoga. Mai 18/19: Ashtanga Yogan zeure lehenengo urratsak emateko asteburua. Comienza a practicar Ashtanga Yoga a un precio increíble. Start practising Ashtanga Yoga at an incredible price. Ashtanga Yoga praktikatzen hasi prezio sinestezinarengatik. 4/5/6/7 abr: Ashtanga Yoga para el resto de tu vida. 4/5/6/7 Apr: Ashtanga Yoga for the rest of your life. Api 4/5/6/7: Ashtanga Yoga zeure bizitzarako. 12/13 ene: Un fin de semana para dar tus primeros pasos en Ashtanga Yoga. 12/13 Jan: One weekend to take your first steps in Ashtanga Yoga. Urt 12/13: Ashtanga Yogan zeure lehenengo urratsak emateko asteburua. 9/10/11 nov: Fin de semana de filosofía de yoga con Arvind Pare. 9/10/11 Nov: Yoga philosophy weekend with Arvind Pare. Aza 9/10/11: Yoga filosofia asteburua Arvind Parerekin. 27/28 oct: Relación entre asana y pranayama. 27/28 Oct: Relationship between asana and pranayama. Urr 27/28: Asana eta pranayamaren arteko lotura. 29/30 sep: Un fin de semana para dar tus primeros pasos en Ashtanga Yoga. 29/30 Sep: One weekend to take your first steps in Ashtanga Yoga. Ira 29/30: Ashtanga Yogan zeure lehenengo urratsak emateko asteburua. 21-24 jun: Cuatro mañanas estilo Mysore con Peter Sanson. 21-24 Jun: Four Mysore style mornings with Peter Sanson. Eka 21-24: Lau goiz Mysore era Peter Sansonekin. 7/8 abr: Un fin de semana para dar tus primeros pasos en Ashtanga Yoga. 7/8 Apr: One weekend to take your first steps in Ashtanga Yoga. Api 7/8: Ashtanga Yogan zeure lehenengo urratsak emateko asteburua. 27/28 ene: Un fin de semana para dar tus primeros pasos en Ashtanga Yoga. 27/28 Jan: One weekend to take your first steps in Ashtanga Yoga. Urt 27/28: Ashtanga Yogan zeure lehenengo urratsak emateko asteburua.